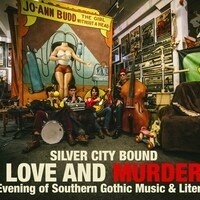 LOVE AND MURDER: An Evening of Southern Gothic Music & Literature, featuring Americana band Silver City Bound in collaboration with Director Kent Stephens and students from the University of North Carolina School of the Arts. Tickets for the show can be purchased online at http://www.cvent.com/d/pvqlpp. Silo Bistro & Bar will be on site with beer and wine for sale.